He once balked at the idea of taking up the game of hockey, but his initial opposition to the sport didn't derail what has turned to be an extremely impressive NHL career. It was over 30 years ago when Chris Pronger watched his older brother, Sean, who would also skate in the NHL, getting ready for his first-ever hockey game. When their father, Jim, asked if the younger sibling would like to lace up the skates, he declined the offer. So, who would ever think that the strapping young kid from Dryden, Ontario, would go on to play nearly 1,100 games at the National Hockey league level, win the Hart Trophy as the league's most valuable player in the 1999–2000 season (the first defenceman to win the award since Bobby Orr in 1972) and have two Olympic gold medals to his name? There has never been any doubt when it comes to Pronger's passion for hockey or his competitive nature, a player who simply hates to lose and does everything in his power to avoid defeat. That was evident even in his younger days. "Sean and I used to play the game every waking moment," recalled Pronger, who learned to skate at the age of three. "And I guess you could say things were a little intense between the two of us every now and again." After two much-hyped seasons of junior hockey with the Peterborough Petes of the Ontario Hockey League, Pronger made his big-league debut in the 1993–94 NHL season, appearing in 81 games for the Whalers and earning a spot on the NHL All-Rookie Team. After a second season in Hartford, he was traded to the St. Louis Blues for star forward Brendan Shanahan on July 27, 1995. In the early years of his St. Louis career, Pronger played under coach and general manager Mike Keenan. He would eventually become the team's captain, from 1997–2003. In his third campaign with the Blues, Pronger, at 23, was again named to the All-Star team. In 1999–2000, he recorded a career-high 62 points and a plus-52 rating. His efforts culminated in a Norris and Hart Trophy at the end of the season. Pronger nosed out Art Ross winner Jaromír Jágr by just one point in Hart Trophy voting, which was, at the time, the smallest margin of victory in the history of the award. He notched 47 points the next season, but appeared in only 51 games due to injury issues. In February 2002, Pronger was a part of the Canadian entry that broke a 50 year Olympic drought and captured gold in Salt Lake City. He also enjoyed another strong NHL season and, once again, appeared in the All-Star Game. Injuries sidetracked Pronger in 2002–03, limiting him to just five games played. But he showed his resiliency and bounced back with another quality season in 2003–04. Following the 2004–05 NHL lockout, the Blues traded Pronger to the Edmonton Oilers for defencemen Eric Brewer, Jeff Woywitka and Doug Lynch. With the Oilers he also served as a rotating alternate captain when other teammates were injured during the 2005–06 season. On July 3, 2006, Pronger was traded to the Anaheim Ducks for forward Joffrey Lupul, defensive prospect Ladislav Šmíd, Anaheim's 2007 first-round draft pick (traded to the Phoenix Coyotes), a conditional first-round draft pick and Anaheim's 2008 second-round draft pick. Pronger played an important role for the Ducks in their championship campaign of 2007. With the Stanley Cup victory he became a member of the Triple Gold Club, which recognizes players who have won Olympic Gold, a World Championship and a Stanley Cup. The 2008-09 season was quite successful for Pronger, who had been named team captain on September 28, 2007. He played his 1000th career game on February 20, 2009 as a member of the Anaheim Ducks. After securing eighth place in the Western Conference, the Duck then knocked off President's Trophy winner San Jose Sharks in six games before falling to the Detroit Red Wings in seven games. 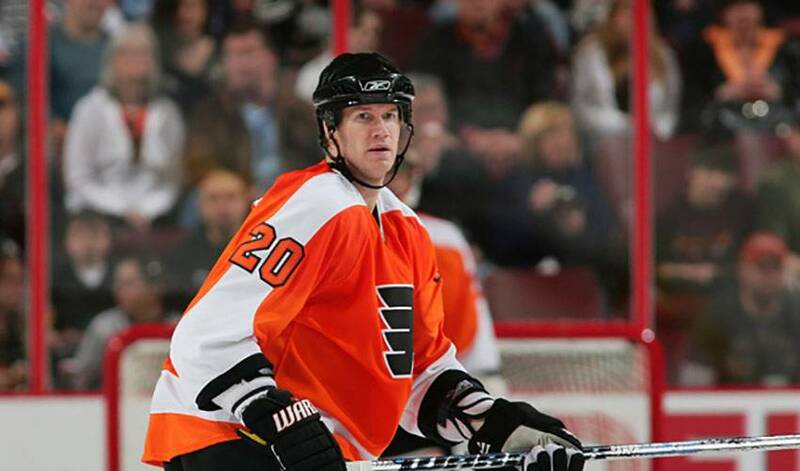 On June 27, 2009, Pronger, along with forward Ryan Dingle, was traded to the Philadelphia Flyers in exchange for forward Joffrey Lupul, defenceman Luca Sbisa, two first-round draft picks and a conditional third round draft pick. It was the second time Lupul and Pronger had been involved in a trade for each other. Less than a month later, he signed a seven-year contract extension that will most likely see him finish his career in Philadelphia. Not too bad for someone who didn't exactly jump at his first chance to play hockey.